Today’s bonus post is specially brought to you by my laziness for not having done a January recap post sooner, and by the funny link party being hosted by Michelle (Decor and the Dog), Kelly (View Along the Way), Chelsea (Two Twenty One), Bliss (Bliss Ranch) and Ashley (Domestic Imperfection). So obviously I HAD to get in on the fun. Take a look at these gems I came up with! This nutella was found on one of our ‘Strip dates’. No, nobody gets naked. We just go exploring down Pittsburgh’s Strip District. This one makes me crack up just because of the look on his face! It’s actually from one of our yet-to-be-shared National Park trips. I told him to flash me his best ‘blue steel’ (Zoolander ftw!) and this is what he gave me! Now, before we get too far ahead into February, lets take a hot second to look at what was accomplished in January. The Tiers of Gifting Yummy Kitchen Frames Book Project Bonanza! Not too shabby for a month in which my laptop nearly died on me. Now let’s see what other goals we can check off the list in the coming months! YESSS! I loved these, ESPECIALLY the throw pillow one. We argue about those all the time! 🙂 Andy thinks they belong on the floor, always, and I happen to disagree. Thanks so much for joining in the fun! Thanks for joining the meme madness!! Haha! These are hilarious! Your husband sure knows how to strike a pose. The giant vat of Nutella would actually be my husband’s dream come true. Thanks for linking up! LOL…. he’s a good sport if he would chevron a cannon! I don’t know if we have ever discussed pillow to couch ratios before, but it’s probably us that’s weird. Don’t think my husband would know what chevron is! lol These are so cute, and what a fun party! Hey, Girl! You have a very handsome guy there! Love the “Blue Steel” look….my daughter and I quote lines from that movie to each other all the time. 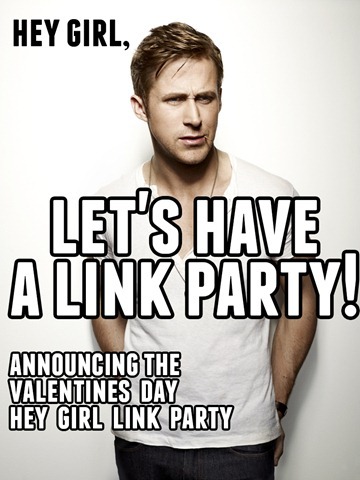 Thanks for sharing your hunk with us over at the “Hey Girl” par-tay! Yes…Blue Steel! LOL Any man that can strike that pose is a keeper! Love Zoolander. LOL One can never have too many throw pillows! I agree, I’m getting a big kick out of his longing poses! These are hilarious….